Former NFL footballer Aaron Hernandez has been found dead in his cell in Massachusetts, officials say. Hernandez hanged himself at the Souza Baranowski Correctional Center and was pronounced dead later at hospital. The former New England Patriots tight end, 27, was serving a life sentence for killing a man who was dating his fiancee's sister. Last week he was acquitted of a drive-by double murder prosecutors said began over an argument about a spilled drink. 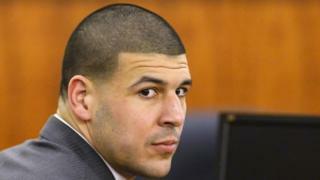 Hernandez had cried in court as that verdict was read, saying he was "very happy". His death comes on the day members of his former team visited President Donald Trump at the White House to be commended for their Super Bowl victory over Atlanta in February. Former team-mates and NFL players have been posting their reaction online to the death. Miami Dolphins centre Mike Pouncey, who played with Hernandez at the University of Florida wrote: "To my friend my brother! "Through thick and thin right or wrong we never left each other's side. Today my heart hurts as I got the worse news I could have imagined." Former wide receiver Donte Stallworth wrote that his thoughts are with Herandez's "sweet little 4 year old baby who has to grow up with this". Jerel Worthy of the Buffalo Bills wrote on Twitter: "Waking up to terrible news. If you have a chance to right your wrongs. Please jump at the opportunity turn over a new leaf and live!" Massachusetts Department of Correction said Hernandez had tried to block the door to his single cell before hanging himself. Lifesaving techniques were performed on Hernandez and he was taken to UMASS Leominster hospital where he was pronounced dead at 04:07 local time (08:07 GMT). State police are on the scene and his next of kin have been notified, officials said. State Department of Correction spokesman Christopher Fallon said in a statement that he was not aware a suicide note had been written and that officials had not been concerned that Hernandez would take his life. Does the NFL have a crime problem? Although Hernandez was acquitted of the double murder last week, he was found guilty of illegally possessing a firearm and the judge added five years to his sentence. Hernandez had been accused of the fatal shooting of Daniel de Abreu and Safiro Furtado outside a Boston nightclub in 2012, one month before he signed a $40m (£32m) contract extension with the Patriots. Hernandez had been found guilty in April 2015 of the first-degree murder of his friend, another American footballer, the semi-professional Odin Lloyd, in 2013. Lloyd's body was found with six bullet wounds less than a mile from Hernandez's home. Within hours of his arrest for the 2013 shooting, the Patriots sacked Hernandez, considered one of the top tight ends playing the game. Hernandez was given a life sentence without parole. Does NFL have crime problem?